This trailer is for the upcoming movie, "The Beautiful Truth," and it shows mercury vapor from conventional mercury fillings venting directly into the air. 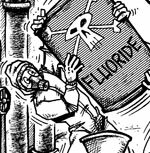 This video documents the proof that the American Dental Association - and its member dentists - have been engaged in the mass poisoning of America for well over a hundred years. This is why I got ALL the mercury removed from my mouth years ago.